The 2017-2018 edition of the Volvo Ocean Race – one of the world’s longest and toughest professional sporting events – has began its stopover in Cardiff, Wales. The transatlantic leg is traditionally one of the nine-month event’s biggest highlights and toughest tests for sailors in often challenging conditions. The sailors departed Newport, Rhode Island, USA, on May 20th and will have covered approximately 2,900 nautical miles before they made landfall in Cardiff. No fresh food is carried on board, so the crew lives off freeze-dried fare and will only take one change of clothes, so stopovers such as this are a welcome sight. This is the first time the Volvo Ocean Race has visited the United Kingdom in more than a decade, but whilst Cardiff will be making its debut as host of the Volvo Ocean Race, it represents a return to its roots since the race began life as the ‘Whitbread Round the World Race’ over 37 years ago. For the Volvo Group, however, the race is more than just a yacht race. 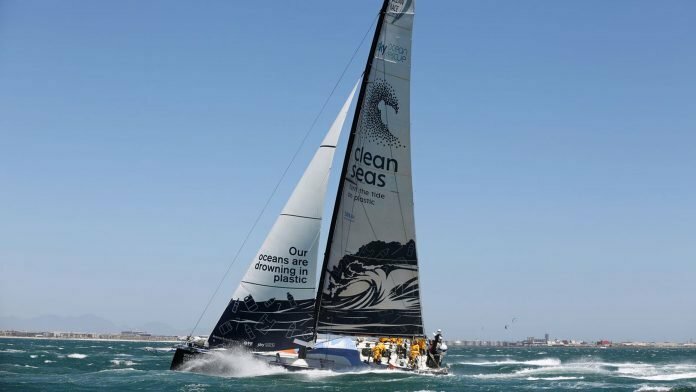 The race represents a unique opportunity to demonstrate the Group’s strong commitment to working to bring about cleaner oceans. As such, Volvo is excited to be inviting you to Cardiff and share in the thrill of the race. See the boats, meet the sailors, watch the in-port race and cheer on the teams as they experience the adventure of a lifetime. Located across the bay from Cardiff city centre, the free-to-enter Race Village which opened for visitors on 27th May 2018. Way Finding towers which will help you navigate the entire experience with each tower featuring screens to keep visitors updated on the Race leaderboard and provide information on local events to ensure no action is missed. Experience the world’s fastest truck with the ‘The Iron Knight’ simulator. A replica Volvo racing yacht, where you can impress your friends with a ‘selfie’. To celebrate the 2017-18 Volvo Ocean Race, Volvo Trucks has launched a LHD-only special edition FH or FH16 truck with Globetrotter or Globetrotter XL cabs that complement the boats with their unique design and world-class performance. For ‘adrenaline junkies’, there will be an exciting Sky Ocean Rescue In-Port Race scheduled for June 8th 2018 at 14:00hrs. At the heart of the Race Village is ‘The Globe’, a large dome that serves as Volvo’s Sustainability Centre to illustrate the growing problem of plastic pollution – as highlighted in BBC’s ‘Blue Planet’ – and explains the need to act now before it is too late. Indeed, one of the boats is named, ‘Turn The Tide On Plastic’ and is helping to spread the message about the damage caused by plastic in the oceans and is actually collecting data on microplastics as it voyages around the world. And, of course, there will be a chance to get ‘up close and personal’ with the actual Volvo Ocean 65 race boats sailed in the race as they sit dockside. The race boats will leave for their penultimate detination – Gothenburg in Sweden – at 16:00hrs on 10th June 2018, ahead of the final leg into Scheveningen, near The Hague in the Netherlands on 24th June 2018. The Volvo Ocean Race is the leading offshore sailing race for crews, with thirteen host cities that make it possible to experience the race at close quarters. The race began life in 1973 as the Whitbread Round the World Race before Volvo acquired the race in 1998 and is now jointly owned by Volvo Cars and the Volvo Group. Since then Volvo have developed and refined it every year, both in terms of the competition itself but also by taking greater and greater advantage of the business benefits and today it is sailing’s biggest offshore race and one of the most coveted prizes in the sport. It lasts for nearly nine months – the longest sports event in the world. The 13th edition of the Volvo Ocean Race is being contested by seven racing boats and for 2017-18 there has been a renewed emphasis on the Southern Ocean and a new set of rules too – incentivising mixed crews of male and female sailors and more strategic innovation out on the race course.